This is one of my favorite dishes. 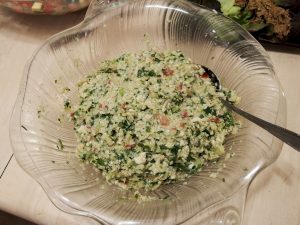 I loved it when I ate it partially cooked before I went raw in 1994, and I still love it now in 2016, but I enjoy it with ground cauliflower instead of the old version made with bulgur wheat. 1. Process cauliflower in the food processor with the S blade until well ground. Remove the cauliflower from the food processor and place in a large bowl. 2. Then food process parsley, tomato, scallions, lemon juice and mint. Pulse several times until well mixed. Add optional diced avocado last, and mix thoroughly. *Variation: Diced cucumber could also be added afterward for variation. this is an unusual reciepe. 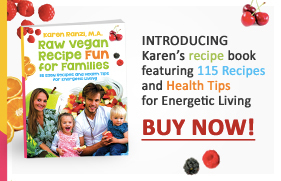 Karen Ranzi has been a leading expert in the field of nutrition and child development for over fifteen years. 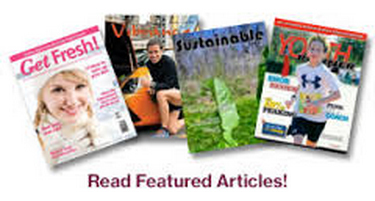 She has been able to help many adults and children to achieve a disease-free wonderful life. 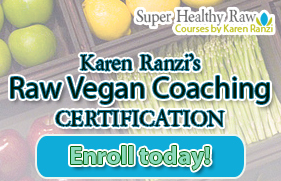 If you are looking for help in creating health, Karen's coaching and classes provide you with the support for success. You may choose in-person or phone consultations with email support. Each person has their own lifestyle background. Karen is able to individualize your needs and assist you from whatever dietary and lifestyle path you have been following. If you would like Karen to speak for your group, please email her at karen@superhealthychildren.com or call (201) 934-6778 to set up a class, or for a private consultation.